Osiris part of the Ennead or Great Pesedjet is also a sacred part of ‘The Holy Trinity’ along with his wife Isis and Horus his son. Osiris as king of the dead became a highly venerated god. He embodied the renewal of life and the promise that every person was destined to live again if they passed the final judgment. Osiris introduced his people to the fruits of the earth , gave them laws and taught them to respect the gods. Osiris is the first of five children of the Earth God Set and the Sky Goddess Nut Osiris, Horus, Set, Isis, and Nephthys. Osiris later married Isis and when Seb and Nut abdicated the throne of Egypt, Isis and Osiris took over rulership. Osiris King of the Earth, became a kind and gentle ruler and was loved by his people. He taught them agriculture, gave them laws to live by and showed them how to worship the Gods. After civilising his people Osiris journeyed to Memphis leaving Isis to rule for him. Isis ruled Egypt and was equally loved by the people as she too ruled justly and fairly. Whilst Osiris was away, Set plotted against him. Set and his 72 followers devised a plan. Set secretly obtained Osisris’s measurements and had a magnificent chest made that would fit only Osiris. Set then invited Osiris to a banquet and offered the chest to anyone that would fit into it. 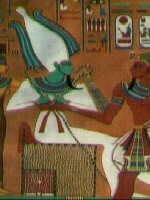 Osiris suspecting nothing and trusting his brother, laid in the chest. Set quickly nailed the lid shut and sealed it with lead to make sure Osiris couldn’t get out. Set then along with his fellow conspirators threw the chest into the River Nile, and by doing so claimed the throne as his own. The chest eventually washed up at Byblos and a Tamarisk tree grew around it. The Chest containing Osiris’s body was found when the tamarisk tree was cut down to make a pillar for the palace of the Phoenicia King of Byblos.